Dock3 protects myelin in the cuprizone model for demyelination. Dock GEFs and their therapeutic potential: Neuroprotection and axon regeneration. Dock3 attenuates neural cell death due to NMDA neurotoxicity and oxidative stress in a mouse model of normal tension glaucoma. Dock3 stimulates axonal outgrowth via GSK-3β-mediated microtubule assembly. Glia- and neuron-specific functions of TrkB signalling during retinal degeneration and regeneration. Regulation of the severity of neuroinflammation and demyelination by TLR-ASK1-p38 pathway. Dock3 induces axonal outgrowth by stimulating membrane recruitment of the WAVE complex. Interleukin-1 stimulates glutamate uptake in glial cells by accelerating membrane trafficking of Na+/K+-ATPase via actin depolymerization. Inhibition of glial cell activation ameliorates the severity of experimental autoimmune encephalomyelitis. Neuroprotective effect of geranylgeranylacetone against ischemia-induced retinal injury. The potential role of glutamate transporters in the pathogenesis of normal tension glaucoma. Glycated albumin induces activation of activator protein-1 in retinal glial cells. Molecular regulation of visual system development: more than meets the eye. Effect of photoreceptor degeneration on RNA splicing and expression of AMPA receptors. Role of monocyte chemotactic protein-1 and nuclear factor kappa B in the pathogenesis of proliferative diabetic retinopathy. Expression of olig2 in retinal progenitor cells. Effect of p75NTR on the regulation of photoreceptor apoptosis in the rd mouse. 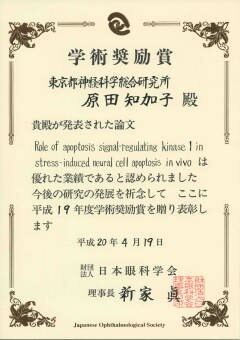 Role of apoptosis signal-regulating kinase 1 in stress-induced neural cell apoptosis in vivo. Effect of p75NTR on the regulation of naturally occurring cell death and retinal ganglion cell number in the mouse eye. Activator protein-1 in epiretinal membranes of patients with proliferative diabetic retinopathy. Phosphorylation of extracellular signal-regulated kinase and p27(KIP1) after retinal detachment. Disappearance of p27(KIP1) and increase in proliferation of the lens cells after extraction of most of the fiber cells of the lens. Phosphorylation of p27(KIP1) in the developing retina and retinoblastoma. Role of neurotrophin-4/5 in neural cell death during retinal development and ischemic retinal injury in vivo. Expression of maf-B mRNA in the epithelium around the eyelid closure of the mouse eye at embryonic day 18. Involvement of p27KIP1 in the proliferation of the developing corneal endothelium. Activation of nuclear factor-kappa B in the conjunctiva with the epithelial scraping of the mouse cornea and human epidemic keratoconjunctivitis. Distribution of p27(KIP1), cyclin D1, and proliferating cell nuclear antigen after retinal detachment. Involvement of p27(KIP1) in proliferation of the retinal pigment epithelium and ciliary body. Diverse NF-kappaB expression in epiretinal membranes after human diabetic retinopathy and proliferative vitreoretinopathy. Potential role of glial cell line-derived neurotrophic factor receptors in Müller glial cells during light-induced retinal degeneration. Neurotrophin-3 is required for appropriate establishment of thalamocortical connections. Microglia-Müller glia cell interactions control neurotrophic factor production during light-induced retinal degeneration. Proliferation in the posterior region of the lens of c-maf-/- mice. Involvement of p27(KIP1) degradation by Skp2 in the regulation of proliferation in response to wounding of corneal epithelium. N-acetylated-alpha-linked-acidic dipeptidase inhibitor has a neuroprotective effect on mouse retinal ganglion cells after pressure-induced ischemia. Modification of glial-neuronal cell interactions prevents photoreceptor apoptosis during light-induced retinal degeneration. Severe optic disc edema without hydrocephalus in neurofibromatosis 2. Functions of the two glutamate transporters GLAST and GLT-1 in the retina. Light-induced retinal degeneration suppresses developmental progression of flip-to-flop alternative splicing in GluR1. A case of bilateral optic neuropathy and recurrent transverse myelopathy associated with perinuclear anti-neutrophil cytoplasmic antibodies (p-ANCA). copyright©2012 HARADA EYE CLINIC all rights reserved.